This is Catherine O'Brien's latest CD. 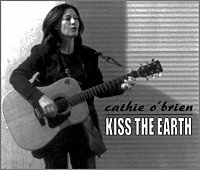 "Kiss the Earth" was independently produced after enquiries from the public who, after hearing the CD, asked to buy a copy. The duration of the CD was limited by time and cost constraints. For more about the story behind KISS THE EARTH click here. Lyrics are included with each CD. The following samples are in MP3 format. You may need some software to listen to these such as Microsoft Media Player. To hear each sample, click on the links below. © Copyright 2001-2009 Catherine O'Brien.